« Is The New IndyCar TV Deal Nearly Done? Most IndyCar fans do a lot of reminiscing about the good old days. I know I do. I’m not really sure when the good old days actually took place, but I guess it’s safe to say that they took place prior to 1996. There were certainly a lot of things that make us smile about yesteryear when it comes to IndyCar and the Indianapolis 500, but when it comes to offseason promotion – we may be living in the good old days right now. While the NFL has its problems and can’t seem to get out of their own way lately, no one can argue that they do a great job of keeping their product relevant and in the news twelve months a year. We are barely three weeks past the Super Bowl that concluded the 2017 season, and we are already into the NFL Combine that started yesterday. On the surface, one would wonder who would possibly tune in to watch kids that were in college just two months ago, go through a litany of drills against the clock. But I’ll admit that I’m guilty of tuning in a few times each year. Once the Combine is over, there is NFL free-agency that starts March 14. Fans follow free-agency closely, to see if their team will be able to hold on to their stars or if they’ll be able to spend ridiculous money to hopefully upgrade their team. The NFL Draft takes place April 26-28. May has mini-camps and the NFL Spring Meetings and July sees the start of Training Camps. If you are an NFL die-hard – the NFL does a very good job of keeping you informed and entertained throughout the offseason. Die-hard IndyCar fans have not always been able to say the same thing. In the eighties and nineties, there were the various magazines and periodicals that we’ve discussed here before. I didn’t buy a computer and access the internet until January of 1998. I was happy to see that information was easier to come by. Trackside Online (TSO) came along in 2002 and did a great job filling a large void. Not only did they deliver fresh news in the offseason, they also had good op-ed articles. They still do. If you are not a member of TSO, you are missing out. It is the best twenty-two dollars you will spend all year. While the news outlets were improving for IndyCar fans, the series and the Indianapolis 500 were still lagging in keeping their brands active throughout the offseason. In the early nineties, when IMS had the Indianapolis 500 and that was it – there was not much going on in the way of keeping the Indianapolis 500 or The Speedway in the public’s eyes and minds in the offseason. When the Month of May was over, they pretty well closed up shop until next year. The Museum and gift shop was open, along with the tour bus – but year-round promotion was never even thought of. I know many of you absolutely hate social media and sometimes I look at it as a necessary evil. The incessant whining and complaining about the latest thing that someone found offensive grows tiresome very quickly. But that is balanced out by all of the good racing news and photos instantly available through twitter and Facebook, which are the two that I use. I don’t do Instagram or Snapchat or whatever is the latest fad among twelve year-olds. But the instant access to everything IndyCar related makes all of the political posts (almost) bearable. I credit IMS President Doug Boles for not only listening to fans and interacting with them at race tracks; but for understanding the importance of social media. Boles is very savvy when it comes to social media and he does a good job of utilizing it to always keep a fresh message to fans. The NFL Network carries the Combine, the Draft and all of the meaningless pre-season games. There is only one thing I can think of that’s worse than watching an NFL pre-season game, and that’s watching a taped pre-season game that was played several nights ago. But I’ll confess that sometimes my TV will strangely land on the NFL Network in August, just to watch those very games I just complained about. IndyCar has no such channel – at least not on cable. But they and the Indianapolis 500 have Twitter, Facebook and You Tube accounts where videos and even live programming can be found. This is where Doug Boles does such a great job. Boles makes sure that anything and everything that involves the Indianapolis 500 is now a big deal and should be carried live on social media. This includes celebrations like the presentation of the “Baby Borg” to the previous year’s winner, the unveiling of the new Indianapolis 500 ticket for the upcoming Month of May and the revealing of the Carb Day bands like they did yesterday with Train and Blues Traveler. Announcing the Pace Car used to be a big deal, but with the IMS deal with Chevy – we all know it’ll most likely be a Corvette or Camaro each year, so it’s hard to generate much excitement about that. One of my favorite things to see on social media should be coming up in the next week or so; the mailing of the blue envelope. 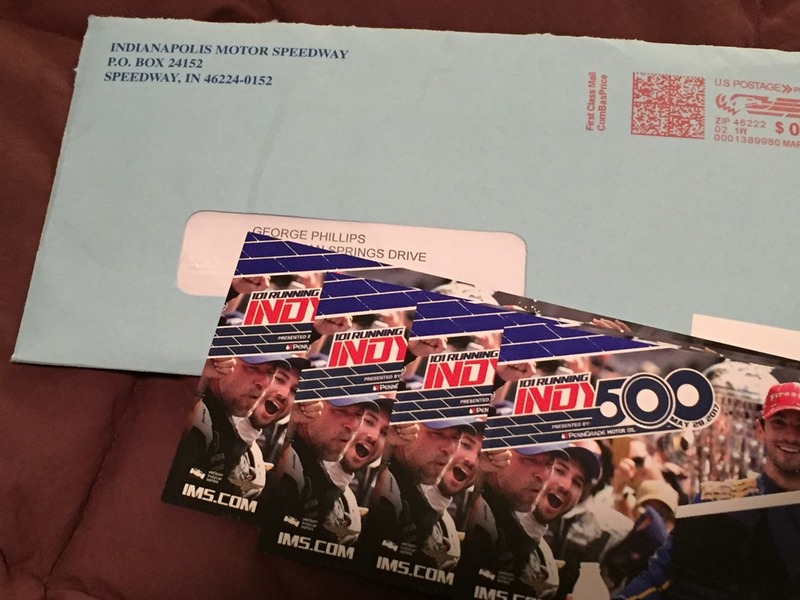 Indianapolis 500 fans know that the blue envelope is how the tickets arrive in the mail. Ten years ago, you would just find the tickets in your mailbox one day, usually in March. The last few years, Doug Boles has been tweeting out pictures of bins and bins of blue envelopes being loaded into US Mail trucks – and yes, “trucks” is plural. Boles recognizes that something as mundane as a mass mailing can become an event for fans, and he has artfully turned it into a rite of spring for the past few years. I mean, if the NFL can turn timing college player in the 40-yard dash into must-see TV, why can’t a mass mailing generate some buzz. Fans complete the process and I’ve joined in the fun myself. It is now a tradition to take a photo of the blue envelope (carefully covering my address for privacy) with the tickets fanned out to cover the barcode and the exact location of my seats. I’m sure the barcode could be reproduced somehow by crafty counterfeiters. I’m sure more than a few people get tired of seeing everyone showing their tickets online, but it’s how we fans celebrate in March. Then of course, the open test at IMS on Tuesday March 27 will be streamed live. I’ve made sure to keep my work calendar free that day. This is just another example of how IndyCar and IMS in particular have used the internet and social media to promote the one race in May throughout the entire year. It’s what needs to be done in this era. IndyCar has been a step behind Doug Boles and IMS for the past few years, but they seem to be catching up. I don’t know who is now responsible for IndyCar promotional efforts. It may be Curt Cavin in his new role since leaving The Indianapolis Star, or if it’s someone in media relations. But whoever it is, they are doing a good job of keeping up with technology in this new digital age we live in. This entry was posted on February 28, 2018 at 4:04 am and is filed under IndyCar. You can follow any responses to this entry through the RSS 2.0 feed. You can leave a response, or trackback from your own site. I’m guessing it is a challenge to get drivers on a reality TV show every fall and/or spring, but the series is closer to that than one might think. I would like to see as part of the new TV deal a daily (or even weekly) motorsports show that covers non-NASCAR racing. Both FS1 and NBCSN have weekly hour long shows that cover NASCAR exclusively. After the 1st 10 minutes, the rest is just fluff. So I have an idea…Call the show RPM2Night and have, say John Kernan as the host! One IRL thing I did enjoy was the early January Disney race, wish we had something like that again that would keep the sport out there in the wintertime. It was cool seeing that race, taping it and watching over and over until the real season started, haha! There is only one racetrack at the time that may be suitable for an event like this and that is Homestead. Who knows if the Miami metropolitan area is ready for IndyCar again at this point? An early January race might not sit well with owners, though, because with a date like that, they cannot really lay off staff during the offseason because the crew will be needed on the track right in the middle of that offseason. I haven’t a clue if a race at that time of year is seriously being considered as a schedule extension. However, my choice for a schedule extension would be located either in Georgia or Virginia for business reasons, apart from the Milwaukee Mile, that is just a great track.